Here’s the email I got tonight. You need to TELL these people what you think. Period. GRESHAM, Ore. – City staff are asking for the community’s feedback on what’s important when it comes to getting around town. A Transportation System Plan (TSP) Community Forum is from 5:30-7:30 p.m. Tuesday, July 26, in the Springwater Trail Room at Gresham City Hall, 1333 N.W. Eastman Parkway. Gresham is updating its TSP, which outlines the transportation system’s 20-year vision, goals, policies, actions and implementation plan. It’s a plan for all major modes of travel – automobile, bicycle, freight, pedestrian and transit – and considers how each type of travel functions alone and interconnected citywide and beyond. The City’s TSP was created in 2002. This is the first update to consider the area’s many changes including significant development, a rapidly growing population, the adoption of the Springwater and Pleasant Valley areas, and revisions to plans for the Historic Downtown and Civic neighborhoods as well as Rockwood. Gresham is required to update its TSP to make sure its plans and projects are compliant with Metro’s Regional Transportation Plan. In addition to gathering community feedback, Gresham is inventorying the existing system’s current condition, analyzing traffic volumes and pinpointing areas where the TSP needs refinement. The updated TSP is scheduled for Council adoption in fall 2012. For more information visit GreshamOregon.gov/tsp. Oh, and they get their gubmint money, too. Story here. Sigh. 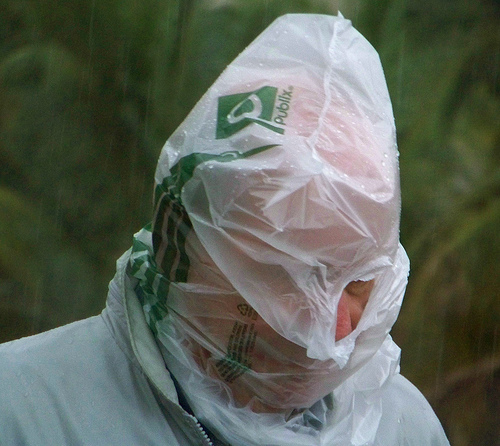 Portland’s Rainbow City Council takes up another plastic bag ban this week and once again I’ll go through the clearly obvious lies, jive, denial of reality and faulty logic that these guys will use to sell their product ban. Their logic is about at thin as those bags. Sam Adams feels an unalloyed moral imperative to get rid of “plastic” bags. Of course morality was missing in action when he bedded a teenager but it’s returned now and he has plastic bags in his “gun murder” sites. The Mayor was kind enough to come on my program on Friday. 1. They’re not “plastic” bags. They’re ethylene, a by product of ethane which ordinarily would be burned off into the atmosphere if they didn’t make bags out of the stuff. They’re not petroleum based. It could be argued that creating these bags actually HELPS the environment. 2. They’re not “single use.” Anti corporate types and environmentalists–but I repeat myself–have dubbed them ‘single use’ to somehow demonize them and marginalize their usefulness. I think most people are hip to this contrivance, but not the mayor who thinks we’ll fall for his clap trap. 3. There’s nothing wrong with using–as he claims–444 bags a year. Who cares? Take them back to the store and recycle them, already! Better yet, have trash/recycle guys pick up everybody’s ethylene bags at the curb. For crying out loud, they want to pick up our food scraps and pick up our trash every other week, why not the bags? What does it matter that people use lots of these bags per year? Because we use something it should now be demonized? Why? Plus, if his numbers are true, doesn’t it mean that these items are useful and well loved and used? 4. Sam Adams says San Francisco is doing it so it must be a good idea. So what? Those pinheads have banned Happy Meals and goldfish sales too. 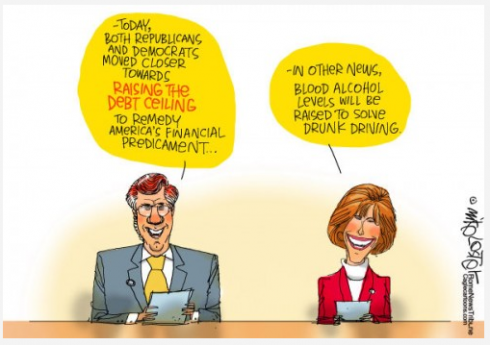 These are the arbiters of probity? Pul-eeze. The San Francisco Board of Supervisors has forgotten the real job they’re supposed to do, taken leave of their senses and imagine themselves Kings. Sam, if your friend jumped over a cliff would you follow him, too? Don’t answer that. 5. Sam told me in the interview that he’s seen the ravages of plastic when he lived in Newport and cut open the bellies of fishes. Apparently he’s just recovering those memories now because heretofore he’s never mentioned it. Amid my guffaws I think he claimed that there was plastic ‘film’ inside the bellies of the fishes. I want to see it. 6. He knew better than to trot out the garbage isle twice the size of Texas fantasy on my show but that hasn’t stopped him from telling news reporters this fiction. As an Oregon State University professor has admonished: stop saying the garbage isle is twice the size of Texas. It’s not. It’s smaller. Greenpeace has told these flakes to stop saying these isles or gyres are full of plastic bags. That’s a lie. If there’s plastic in there it’s fishing line and nets. The city did too use this poll question as support for their ban. The mayor now denies it. Even though a call to the Mayor’s office couldn’t produce a picture of this huge swirling mass of garbage, Roy Kauffman, Sam Adams’ spokesman, says he’d seen pictures at this website. Eric the Great combed through the website. No pictures. You know, you’d think anything that big should have a resort on it or something, but it isn’t there. Even if the Mayor’s office (relying upon environmentalist websites for his ban information) calculate “twice the size of Texas” in linear miles, it’s still a 5,000 mile long span of garbage isle. The distance from southern Oregon to the Bering Straight is 2,300 miles, so you’d think SOMEone would have seen a 5,000 mile long span of garbage off the coast. We’re waiting for the pictures. 8. Bags in the landfill is not all bad. As the Save the Plastic Bag people point out the bags help create a barrier to keep methane from escaping into the atmosphere. As the enviros keep pointing out methane is a worse ‘greenhouse’ gas than CO2–unless they change their minds. So where’s the plan to ban cans, cups, bottles, diapers and Clear Wireless flyers? 10. The mayor says people who love plastic bags and don’t like paper (which will be next on the ban or tax list in my opinion) such as the elderly and handicapped will be able to pick up (convenient, huh?) a GOVERNMENT ISSUED BAG. And as an added bonus I’ll give you another reason why the bag ban is stupid. Company Profile:Sourcing, developing & marketing eco-friendly products & materials. Stretch wrap, biodegradable shopping bags, compostable bags & reusable bags. 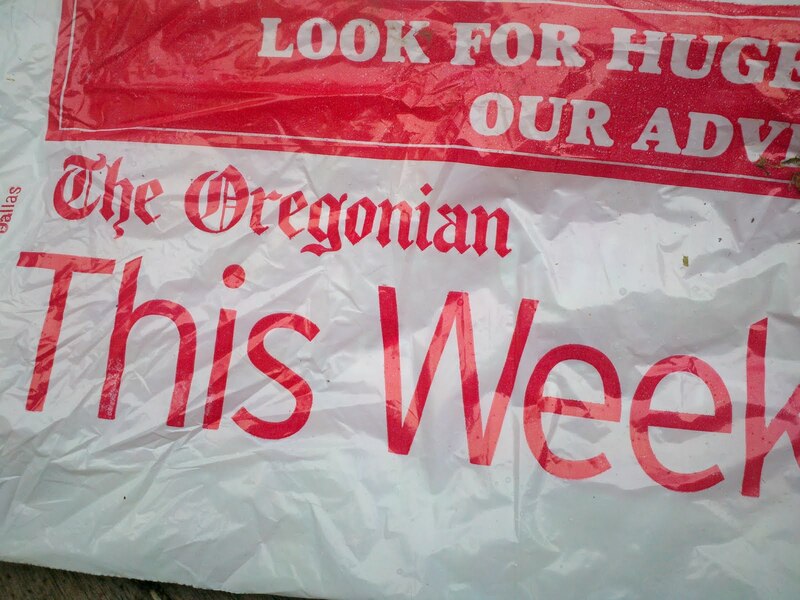 Oregonians use an estimated 1.7 billion single-use plastic checkout bags each year—the equivalent of 444 bags for every man, woman, and child in Oregon, every year. That’s a bad habit worth kicking. Growing up on the Oregon coast, I saw firsthand the devastating effects that discarded plastic has on our waterways and wildlife. In Portland, and in all of Oregon, single-use plastic checkout bags are an eyesore, getting into our waterways and our storm drains. Plastic bags are a nuisance, jamming up recycling facility machines and costing those facilities tens of thousands of dollars a month in maintenance and labor to fix the mess. And globally, plastic bags are part of an environmental crisis—from the oil needed to manufacture and transport bags around the planet, to the massive plastic islands of trash destroying our oceans and intoxicating our marine food web. That’s why I’m introducing an ordinance at City Council on July 21 at 3:45 pm that would prohibit the largest generators of single-use plastic checkout bags—large grocery stores and large retailers that have pharmacies—from distributing these bags to their customers at point of sale. See today’s Oregonian story for more details. This policy is a pragmatic approach to a real and seemingly insurmountable problem, and was shaped by a coalition of businesses, environmental groups and city staff, and informed by lessons from cities and nations that have already taken action on single-use plastic checkout bags—from San Francisco to China. Portlanders are prepared to lead the way in Oregon. If approved, the ban would take effect on October 15, 2011. The policy also promotes the use of reusable checkout bags, and provides reusable bags free-of-charge to qualifying low-income residents and seniors. This initiative does not mandate retailers to charge a bag fee, and does not prevent retailers from offering a reusable checkout bag discount. Full details of the proposal, including answers to frequently asked questions and a copy of the ordinance, can be found at mayorsamadams.com/bagban. Portland and Oregon have always led the nation on smart environmental policy. Portland’s economic prosperity is being built on our creativity, our innovation, our expertise in sustainability, and our heritage of great manufacturing. By taking action now, we’re continuing our city’s leadership in sustainable urban living and making an investment in our city’s future. When do the Portland Professional Planners throw aside their preference for preciousness? When it’s in favor of bike paths. 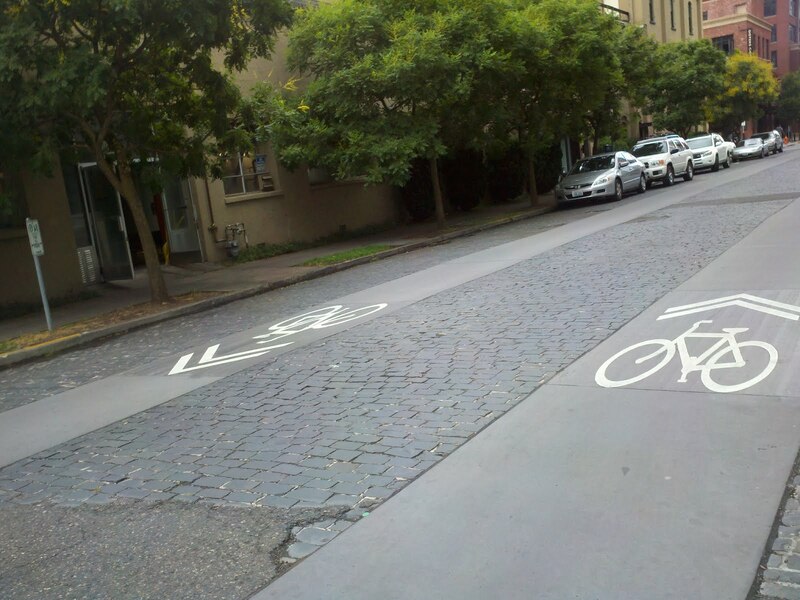 Who rips out quaint cobblestones for concrete? I thought we were concerned with preservation etc. TREES are protected around here, for crying out loud! …[T]he Eastside Streetcar Loop project, a $128 million, 3.3 mile extension of the streetcar that will loop from the Pearl District, across the Broadway Bridge and down to OMSI. The project will turn NW Lovejoy and NW Northrup (two blocks north) into an east-west couplet (one-way traffic in each direction). As part of that construction, the bike lanes currently on Lovejoy will be removed and Marshall and NW Johnson (four blocks south) will become the preferred bikeways. 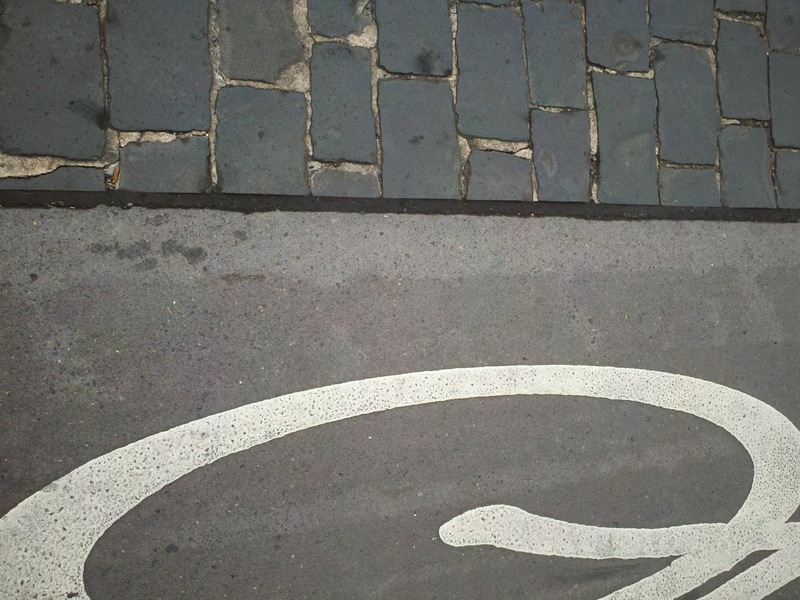 They pave over cobblestones in Amsterdam so it’s OK! 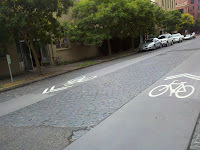 But this hacked off even NW PDX libs who decried the defacement and noted REI replaced cobblestones when it came to the ‘hood along NW Johnson. The way I figure it is: if they can rip up street over a century or so old, I can get rid of that tree that’s subsuming my yard. Fair enough? Not exactly how I like to begin my Sunday mornings, but in reading today’s emails was Jane Fonda: QVC axed my appearance over politics wherein, Jane Fonda, dubbed Hanoi Jane for her anti-war activities and stabbing Vietnam Veterans in back is now upset over QVC cancelling her appearance to hawk her new book, Prime Time. The fiery supporter of communism years ago, who has made several Millions of Dollars through the very capitalist system she once condemned now claims, “this has gone on far too long, this spreading of lies about me! None of it is true. NONE OF IT!” on her personal blogsite. We remember well what you did, when you did it and how it affected us. We recall your activities in enticing soldiers to desert. We recall your ill fated and major flop of a movie, FTA denigrating the Military. We’re well aware of your words to UC Berkeley students of 34 American B-52s being shot down, with complete disregard for the fate of the American crew members in each. They too were American Service members that you now claim you have never done anything to hurt. 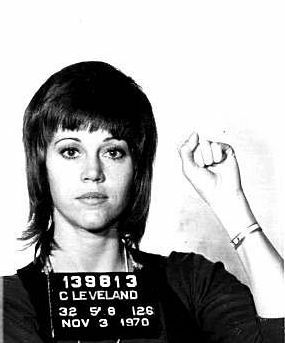 The 73 year-old actress may receive the assistance of Jerry Lembcke in trying to recreate her treasonous activities as a “myth,” but he is in a distinct minority. No, we are aging Veterans, mostly men who served honorably to try to keep some people free from the grips of the very system you advocated and apparently abandoned to grow your own wealth. We are the recipients of the decades of denigration in Hollywood movies, TV shows of the era and the real myths said about us by the likes of you and scum like Senator John F’in Kerry. We have endured the hate spewed at us while you run around the globe adding to your many Millions of Dollars. We are the men who society has looked down upon and treated as hapless drug addicted victims when we are anything but. So cry me a river that QVC cancelled your appearance to increase your fortune. Instead of crying, you should go off somewhere and finish out your years in the shame you deserve. This Says It All, Doesn’t It?